“Can I play in there?” said Small. “Ice cream at 10 o’clock!” said Large. Not everyone finds Switzerland agreeable, but for our family it was the perfect holiday destination. And we didn’t even have to sell one of the children to pay for it. One of the surprises about Switzerland is that once you have regained consciousness from the cost of accommodation (smack!) and your transport pass (kaPOW! ), the best things can be done for free or minimal cost – exploring this impossibly beautiful and widely varied landscape in your own way in your own style in your own good time. 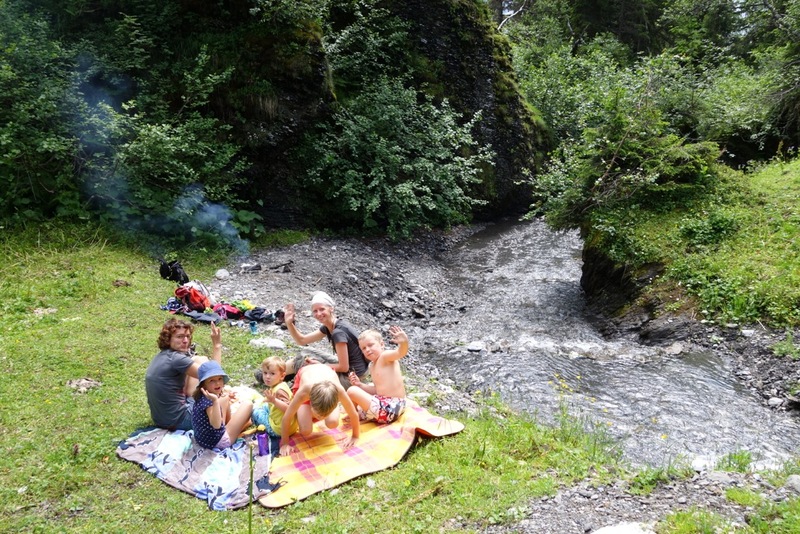 We spent eight days in the Oberland-Bern region based in a little village called Wilderswil. Thanks to a superb network of trains, buses, ships, cable cars, gondolas and funiculars we rarely travelled for more than an hour yet accessed a huge range of environments and experiences – lakes, tiny mountain villages, alpine forest, lush high-altitude plateaus , stark rocky cliffs, fern-covered mountainsides, dramatic waterfalls and even a couple of summits. We had invested in a Regional Pass which cost us €560 [$NZ1.8 million] and meant we could ride on almost all transport without paying the eye-watering single-ride fares that can rise into the hundreds of euros for a family of five. Don’t laugh. Please. And this dreadful, wobbly video opening with men’ backsides will probably make it worse but otherwise who would ever believe that we were waiting for our bacon and onion tarts high on a Swiss mountain when a random travelling yodelling choir spontaneously burst into song? This performance was a thank you gesture for a good lunch – the choir had been marching Swissfully around the mountain all morning, singing all the way. I cried, which may explain the quality of the video. It was too beautiful. “We also listen to modern music,” one chorister told me, proudly. They rummaged around and found us the CD for a mere €30 [$NZ4200). We put it on in the car the day we drove back to France and it had a strangely hypnotic effect on the children. No fights for 200km. Who needs a seatbelt when you’re climbing a vertical cliff? Remote is a word we prize in New Zealand but there are times when you just want to get straight to the good bit and not spend half your day getting there. The Swiss don’t fanny around. Where do you want to go on that mountain? Bottom, middle or top? They’ll get you right there so the fun can start in record time. It might be Europe’s steepest funicular ride (the Gelmerbahn) with a gradient of 106 per cent (that’s practically hanging upside down – no seatbelts). It might be a rocket-fast gondola. It might be a quaint old train that meanders up the side of a cliff as it has done for more than a century. It will not be boring. 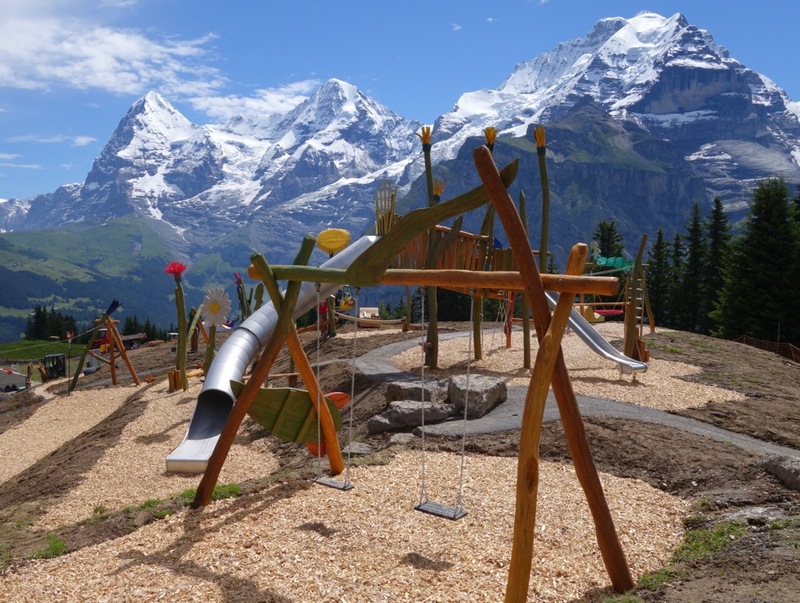 The Swiss understand that when you’ve finished your hiking/biking/trotti-biking/luging for the day you’ll be needing food and drink with a decent view and the children will want somewhere to play. The best playgrounds have million dollar views and are on a slope with a small river running through them so when the kids are finished on the swings, flying fox, climbing ropes and slides, they can spend as many hours as you care to let them just hanging out and playing with sand, rocks and water. An honesty shop – why wouldn’t you reward this kind of trust with perfect honesty? A Bond museum on a mountain top? Why not? Nothing special – just walking the cows into town. The Swiss are just a little bit different. In a good way. I didn’t realise I had this odd vision of Switzerland as a nation of bankers and diplomats working in office blocks with pretty views. I got there and realised of course it is just the same as everywhere else – lots of ordinary people doing ordinary jobs but perhaps having a couple of gnomes in the garden or belonging to a yodelling choir or having a traditional dress in the wardrobe for a spot of cow-herding through the main street. There may well be gold dripping onto the footpaths in parts of Switzerland but in the countryside you’ll find farmers cutting and turning their tiny paddock of hay by hand, selling a few eggs or veggies on the side and renting a room to tourists. “People say Switzerland is expensive but it’s not that much more expensive than everywhere else,” an American who has lived there for many years told me. “Our laws make sure people are paid properly so even if you work at McDonalds you earn €20 an hour and that means everyone is paid properly, everyone has enough money to live, everyone is happy. ” Of course that’s not the whole story, but it is a good part. Hiking for kids. Surprisingly engaging. This is the only place so far that the boys barely grumbled about hiking (or forced marches, as they call them). There are child-friendly orienteering courses at one place, adventure trails at another, flying foxes and, the ever-present rivers to practice rock throwing, damming and rock-hopping.There are sticks galore to practice Swiss Army Knife skills, lightning fast luge rides and even our kids had to admit that the ever-changing views were worth pausing for. “Yes, we are a typical Swiss family,” the lady wearing the scarf called, and encouraged everyone to wave obligingly. You’re hiking in the Alps – of course you’ll want be wanting to take a break, tear open a packet of sausages and light a fire. So the Swiss provide you with a fireplace and a stack of wood. It’s all there just waiting for you in perfectly situated little spots: next to a lake. deep in the forest, next to the woodland adventure playground. It’s probably just for the tourists, because the Swiss are just as likely to make their own from scratch (as above). 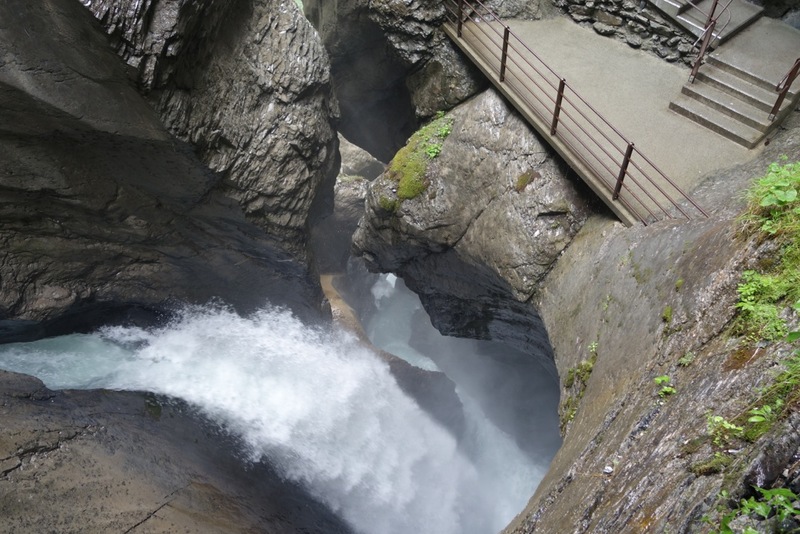 The Trummelbach Falls – 20,000 litres of water per second. The walkways and tunnels inside the falls are an astonishing feat of engineering and mountaineering dating back more than a century. Click on pic to get a better look. The Swiss may produce some very fine bottled water but it’s no skin off their nose if you prefer to save the planet and your pennies by refilling your bottles with pristine water piped for free into public fountains all over the place – straight from the purest mountain waters in Europe. Chocolate box scenery can be underwhelming when you come from New Zealand and eat a lot of chocolate. Not in Switzerland. Snow-capped mountains, lush valleys, insanely colourful flowers, cute chalets, waterfalls, cows with bells. As an aunt once told me, this is a place to stop and engage all the senses. All our senses were well pleased. We walked down this small mountain from Lake Gelmer (1850m) – hair-raising at times with sheer, terrifying drops. It takes very little effort to sidestep the crowds in this very busy part of Switzerland even in the high summer season. Once you are more than about 30 minutes’ walk from the nearest cable car/gondola stop, you have gone further than most tourists are prepared to go. You’ll meet far fewer people and they’ll all be lovely outdoor sorts saying cheerful hellos (Grüezi) and expecting you to do the same. You only need a day or two of sun to get your chocolate box photographs. It’s more pleasant hiking in a bit of cloud as the temperatures on a sunny July day can easily rise into the 30s even high in the mountains. Switzerland looks good, rain or shine. Close the door of your car in a Swiss carpark and you may hear a polite “shomp” because the walls are probably lined with expensive sound-proofing so that lovely outdoor mountain feeling you’ve had all day doesn’t evaporate with a single ear-piercing clatter when you slam your car door. You might even be flashed a personalised farewell message. This happened to us one evening in Interlaken when the car park robot flashed a smiley face and the words: “Gute Fahrt”. How very Swiss to understand that what four lads need after an evening of excellent manners in a Swiss fondue restaurant is to break wind simultaneously the moment they get in the car. Oh Karen The photos are aaaaamazing. Was the lady…or man giving you the middle finger in that photo of the picnickers? Oh Karen, you make me want to get on a plane!!! Sounds wonderful. Fabulous fabulous photos, you’re so clever! Beautiful photos Karen. What a wonderful time you are having together.